Harrison Ford as Indiana Jones in Raiders of the Lost Ark, released in June, 1981. 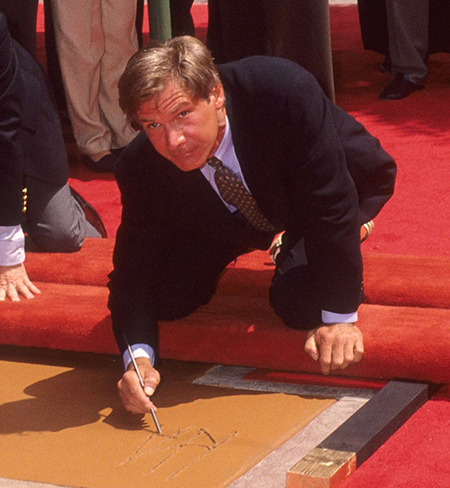 Harrison Ford is one of the world's favorite film stars. Encouraged by George Lucas and Steven Spielberg, his deep voice and boyish personality made him in constant demand by the industy's leading directors. Ford's father was an advertising man who had given up on acting, while his mother had been a radio actress. Harrison grew up in Park Ridge, Illinois and was a Boy Scout, achieving the rank of Life Scout — pretty close to Eagle Scout. In high school, Ford announced sports events for the school radio station. Attending Rippon College in Wisconsin, Ford was a philosophy major. To get over his syness, Ford took an acting class. He became fascinated. He spent the summer of 1964 working in summer stock in Wisconsin, then headed to Los Angeles to make it big. He got a contract at the bottom of the totem pole at Columbia, where he played a played a bellhop in Dead Heat on a Merry-Go-Round (released in October, 1966), with James Coburn. The F.B.I. aired over ABC in November, 1969; he played a young man trying to win Dana Wynter's daughter on Love, American Style aired over ABC in November, 1969. He is in the gang led by Robert Burr terrorizing Dodge City on Gunsmoke aired over CBS in February, 1973. Casting director Fred Roos put Ford in the running to play Bob Falla, the handsome guy in the car with the dame "Ain't he neat?" in American Graffiti (released in August, 1973), with Richard Dreyfuss. Nearly everyone in the monster-hit movie became very busy, but for Ford, success came slowly. Dynasty aired over NBC in March, 1976. Star Wars (played the Chinese in May, 1977), changed all that. His turn as Han Solo suddenly made him one of the world's most recognized actor / characters. They seemed inseparable. Hanover Street (released in May, 1979), with Leslie-Anne Down, attempted to sell Ford as a stand-alone romantic hero, but the film was only so-so. A lot of people thought they were seeing things during Ford's uncredited scene in director Francis Ford Coppola's Apocalypse Now (released in August, 1979). 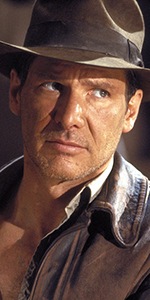 The Empire Strikes Back (released in June, 1980), with its cliff-hanger ending, made Ford a commanding heartthrob, but the Lucas / Spielberg combine had something else up their sleeve for their favorite actor: Raiders of the Lost Ark (played the Chinese in June, 1981), allowed audiences to accept Ford in another perfectly-fit role: Indiana Jones. Ford likes to work. The following summer, he appeared in another game-changer movie, Blade Runner (released in June, 1982), then played Han Solo again in Return of the Jedi (released in May, 1983). Indiana Jones and the Temple of Doom (played the Chinese in May, 1984), became the third mega summertime movie starring Ford in three years. Not letting up at all, Ford appeared in the thriller, Witness (released in February, 1985), with Kelly McGillis, the decidedly counter-cultural The Mosquito Coast (released in November, 1986), with Helen Mirren, and the Euro-thriller Frantic (played the Chinese in February, 1988) — all released in non-summer. Working Girl (released in December, 1988), with Melanie Griffith, became Ford's first real rom-com, released at Christmastime — it worked. So did Indiana Jones and the Last Crusade (which played the Chinese in May, 1989). Ford's films continued to make money — and lots of it, too. His second Tom Clancey film Clear and Present Danger (which played the Chinese in August, 1994), was a hit, and people loved Harry as the president of the United States in Air Foce One (released in July, 1997), with Gary Oldman. Even when he was playing a rotter, as in What Lies Beneath (released in July, 2000), with Michelle Pfeiffer, people loved Harrison Ford. That all began to change with Firewall (played the Chinese in February, 2006), with Paul Bettany; the hi-tech thriller failed to ignite. Indiana Jone and the Kingdom of the Crystal Skull (released in May, 2008), with Cate Blanchett, brought in the fans, but is far from satisfying. Cowboys & Aliens (released in July, 2011), with Daniel Craig, has to mark the end of Ford playing the lead in an action film. Acting his own age, Ford played Brooklyn Dodger manager Branch Rickey in 42 (which had its world premiere at the Chinese in April, 2013), with Chadwick Boseman as Jackie Robinson. Continuing his elder statesman mode, Ford went through Ender's Game (played the Chinese in November, 2013), saying "He's the one" a lot; in The Expendables 3 (released in August, 2014), with Sylvester Stallone, he got to fly his plane around. Star Wars: The Force Awakens (which played the Chinese in December, 2015), not only practically killed him while filming it; he says adieu to Han Solo in the film. We will miss him. He did a cameo in Blade Runner 2049 (played the Chinese in October, 2017), but the film might need as much time as the original film did to find acceptance.